Bicycling is booming throughout New England. Although it’s impossible to know how many people are riding a bike on any given day, we do know it’s become exponentially more popular in recent years. The Boston Bikes initiative resulted in more than 60 miles of bike lanes in the city, hundreds of bike racks, 1,700 donated bikes to youth and the unveiling of the Balance Hubway bike share system – one of the first counties in the nation to do so. There are 38,000 bicycle trips every day just in Boston, with 20 percent of those being work commutes. Boston bicycle accident lawyers at BikeAttorney.com at The Law Offices of Jeffrey S. Glassman recognize that while this is all good news – bicycling is good for fitness, recreation and the environment – there is a downside. Collisions involving bicycles in the Greater Boston suburban areas shot up by 9 percent in a recent three-year stretch, according to the Boston Globe, which used Massachusetts Department of Transportation figures. Statewide, they’ve increased by nearly 15 percent. Seven in 10 bicycle crashes results in injuries. Of course, it’s a statistical fact that the more riders there are, the more crashes there are going to be. 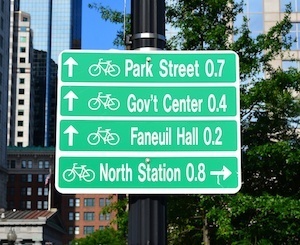 In Boston’s surrounding communities, bicycle commuting increased about 4.5 percent. An estimated 56 percent of residents in Boston own a bicycle and 8 percent said they rode one in the last week. The city’s Boston Bikes initiative has announced plans to reach 10 percent mode share by 2020 (that is, have 10 percent of all trips in Boston be taken by bike), while decreasing bicycle injuries by 50 percent at the same time. The National Highway Traffic Safety Administration (NHTSA) reports that of the 743 bicyclists killed and 48,000 injured nationally in motor vehicle traffic crashes in 2013, six of those deaths were in Massachusetts. (The Centers for Disease Control and Prevention (CDC) have a higher tally for that year: more than 900 U.S. bicyclist deaths and 495,000 emergency department visits due to bicycle-related injuries.) The Globe reports there were 12 deaths in Greater Boston’s suburbs in the three-year period from 2010 to 2012. In Boston proper, the City reports that between 2009 and 2012, there were 1,700 confirmed cyclist incidents to which Boston EMS emergency medical technicians and paramedics responded. Injuries were most likely to result when cyclists were struck by a vehicle, such as a car, truck, bus or moped. Most bicyclists are likely to be struck at an angle. Only about 5 percent of bicycle crashes are head-on collisions, and about 10 percent involve the cyclist being sideswiped, or struck by a vehicle while traveling in the same direction. Allowing a maximum of two cyclists riding together, except on roads with more than one lane in the direction of travel, in which case they must ride in a single lane. Mass. Gen. Law Ch. 85, Section 11B(2)(ii)-(iii), Disallowing babies under the age of 1 to be transported by bicycle and requiring any person under the age of 16 to wear a helmet. Many accidents occur simply because the drivers are not paying attention, aren’t operating safely for road conditions or fail to respect the rights and space afforded to bicyclists on the roadway. Although Boston is one of the more bike-friendly locations in the country, some drivers still harbor resentment for cyclists who share the road. There are also some accidents that occur as a result of poor road design. If you or a loved one has been hurt in a Massachusetts bicycle accident, it’s important to consult with an experienced law firm that understands your rights, the full scope of compensation to which you may be entitled and how best to proceed.